Changelings are rare forest spirits. Although usually humanoid, a Changeling's powers allow them to assume the forms of other creatures and take on their characteristics. Because of this, they can blend into normal society. The most well-known Changeling is Selene, a High Priestess of Shagrath, the God of Spiders. 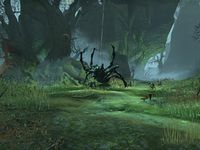 Selene dwelled deep in the Valenwood in a region known as Selene's Web, and could assume the form of a giant spider. She was soul trapped in 2E 582 by the Mages Guild, and was the first Changeling encountered by the guild in thousands of years. Selene later resurfaced in the Third Era and attempted to conquer all of Valenwood during the Imperial Simulacrum. The infamous Alessian general Faolchu was also known as Faolchu the Changeling, although he was seemingly just a powerful werewolf. This page was last modified on 13 August 2017, at 22:27.